Bandon, Oregon is a small town on the Pacific Ocean with an incredible coastline. The many sea stacks make for unique views in all kinds of weather and times of day and night. This image was made when the tide was out, leaving a relatively flat beach with remaining water to give the reflections. Light on the rocks and beach is from the town of Bandon high on cliffs to the left, and from the night sky. It was an eerie time on the beach late at night with no one else around. Waves crashing nearby kept me thinking about what I would do if a big wave came in and I needed to run a long way for safety. The waves crashing are seen as the bright line at the horizon level on the right. 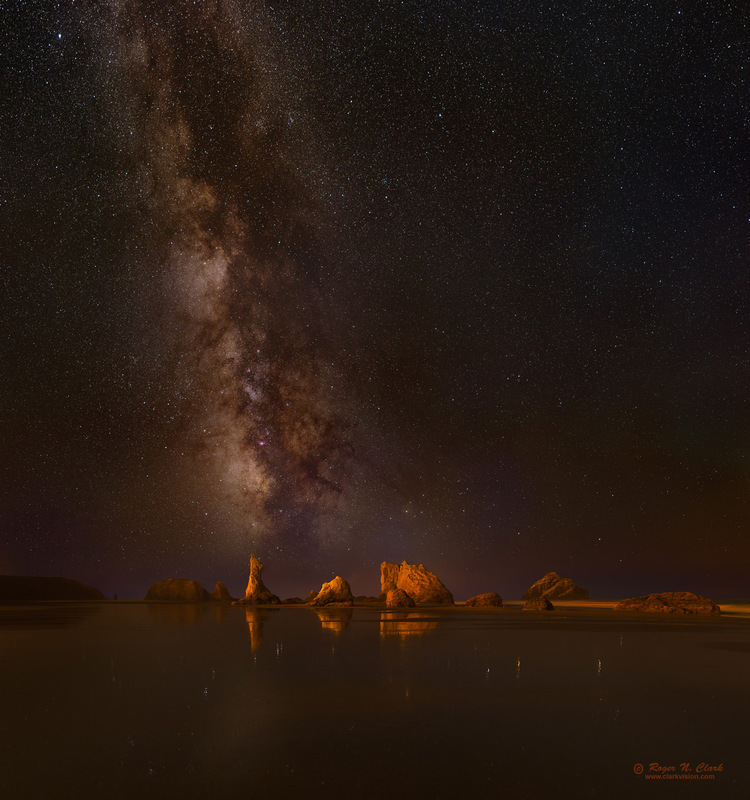 The core of the Milky Way above the sea stacks made for a stunning view. Above the horizon behind the sea stacks were clouds and fog, some lit by lights from fishing boats far in the distance, and with red airglow low on the horizon mixing with the lights and scattering through the fog made for some unusual colors. Airglow is emission from molecules high in the Earth's atmosphere, typically from glowing oxygen emitting green and red at different altitudes above 90 km. Can you pick out the "Dark Horse" in the Milky Way? Technical. This image is central crop from a 21-frame mosaic. Canon 6D 20-megapixel digital camera, Sigma 35 mm f/1.4 DG HSM lens at f/1.4. Thirty-nine exposures at ISO 1600 were made, each a 15 second exposure. Pairs of exposures were averaged together to make 30 second total exposure time per frame on land and sky. The star reflections were single 15-second exposures. Exposure of the stars were tracked using an iOptron SkyTracker. The mosaic included 3 frame positions on land, 3 on reflections, and 15 positions on the sky. This is a natural color image. How do we know the colors are reasonable? The star colors can be checked against stellar photometry. Red stars have B-V > 2, orange stars have B-V of 1 to about 2. The blue-white stars have B-V in the range of 0 to -0.5. The colors closely follow the color sequence in Table 1 at Color of Stars. Solar-type stars have a B-V of 0.63 and appear close to white (daylight white balance). Less than 1% of stars in the Milky Way are blue. Interstellar dust is brownish in color, not the typical fake blue we see in many Milky Way photos we see these days on the internet. For more on natural color in the night sky see Parts 2a, 2b, 2c and 2d on Color of the Night Sky and proper post processing to show those colors.